Sometimes after drawing dudes one after another, a guy’s just gotta spend some time looking at a pretty face. 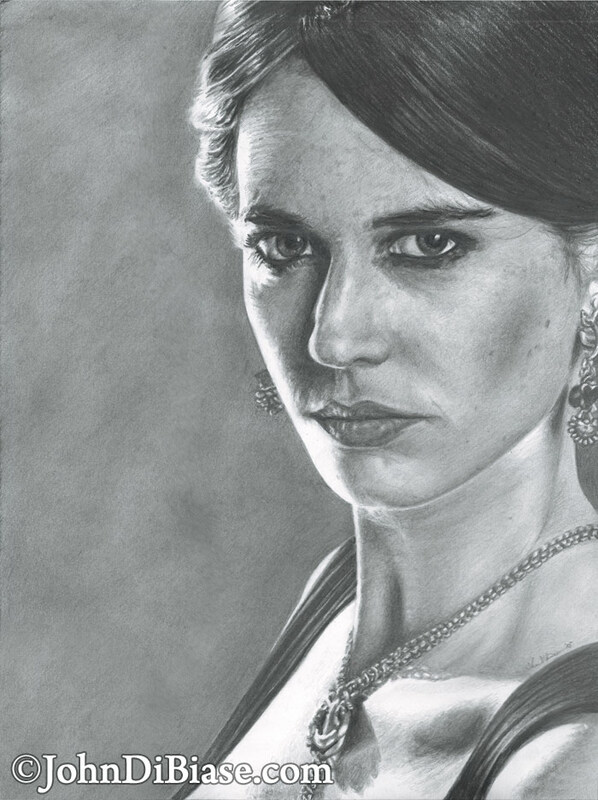 🙂 I’ve drawn Eva Green before — technically twice already (one solo, one with Bond), but I’ve never really been super happy with those. So, when it came time to pick subjects to work on, I actually gravitated to a promo photo of Bond and Vesper (Green) from Casino Royale and started work on that, but struggled with getting Eva’s likeness just right. So I put it aside and found this one, also a promo from Casino Royale, that was used for an ad for jeweler Sophie Harley who designed the Algerian Love Knot that Vesper wears in the film. I then juggled both pieces until finishing this one first. This is a fully graphite drawing using various grades of Staedtler pencils, 0.3 mechanical lead pencils, and an Ebony Jet Black pencil.